Cake Wrecks Book Giveaway! 3 Winners…AWWW YEAH! Today’s giveaway is FUN FUN FUN. Please tell me you’ve heard of Cake Wrecks…if not, you are in for a treat, literally and figuratively. See what I mean? Don’t tell me you didn’t laugh. 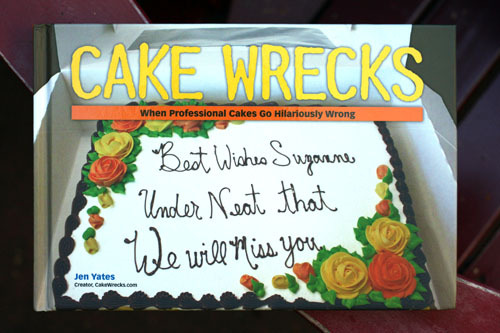 If you haven’t been to the Cake Wrecks blog, I suggest you check it out stat! I discovered Cake Wrecks when they won a BlogLuxe award for Funniest Blog…and then they linked to all the other BlogLuxe winners and WOWZAH I got a lot of traffic that day and realized everyone and their dog had already discovered this wickedly funny site. It fast became a favorite of mine. Anywhoooo….I did say there was a giveaway, right? Yes there is! Cake Wrecks is giving away THREE copies of the Cake Wrecks book (a New York Times bestseller, might I add) to THREE randomly-selected This Week for Dinner readers! Same drill as always, just post a comment and you’re in the running! Comments need to be posted by Midnight, Monday December 7. Winners will be announced on Monday, December 7. And while I hope you win the giveaway…this book is a great holiday gift idea, so you can also buy it here! GOOD LUCK and enjoy the wreckage! I have to begin my post tonight with Ode to the Frozen Turkey, by Yours Truly. How I love you, Frozen Turkey. Your ability to arrive in my kitchen pre-brined is unparalleled. Your little poppy-out-thingy informing me of the exact moment that you are perfectly cooked is a gift. You always come out just how you’re supposed to. You rule, Frozen Turkey. Okay, that Ode is BAD. 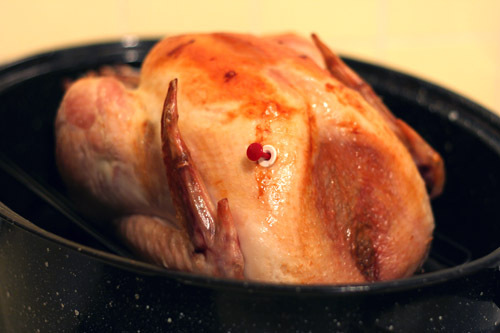 But seriously, the BEST turkeys I’ve cooked have always been pre-brined and frozen, with the little poppy-outy-thingy. I’ve tried all kinds of turkey techniques. The dummy-proof frozen turkey is my favorite. This was one tasty bird, let me tell you. I actually just finished cooking our second Thanksgiving Feast for the week. I simply wanted more leftovers…and an excuse to make more Sweet Potato Souffle, by far my favorite dish from our menu (thanks for sharing the recipe, Mindy!). Enough Thanksgiving chatter…on to the menu with leftovers galore! – I’m actually going to consult with Cate on this…but she’s in bed, so I’ll fill in the plan later on. I hope you all had a wonderful Thanksgiving weekend! And now that the holiday is over…get back in the groove and get your menus up here! PS…I’ve got a REALLY fun giveaway lined up for tomorrow…don’t miss it! Have a happy thanksgiving, filled with great food and even better company! And, no, I did not make this beautiful pie. I happily handed my money over to my friend Faye the pastry chef. 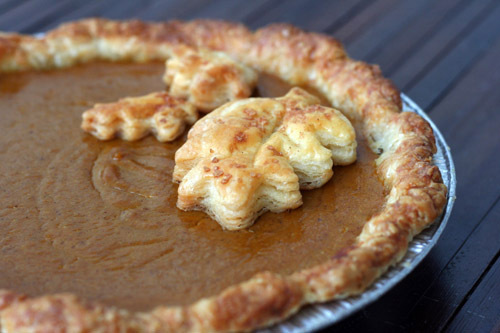 Word on the street is that she has perfected the pumpkin pie. We can’t wait to dig in later today! Thanksgiving and cranberries go hand in hand. 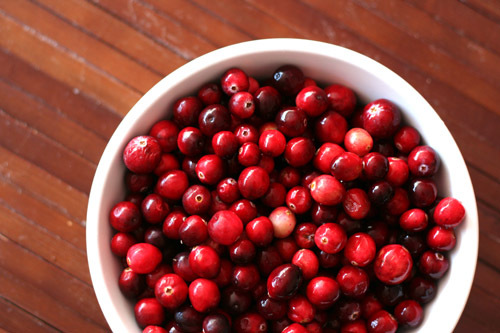 Today I thought I would share two of my favorite cranberry recipes with you. The first is Cranberry Slush, a drink that is a Thanksgiving staple in my family. Click here to read about it and see the recipe. The slush needs to be frozen, so don’t forget to make it a day or two before! Also…go for the quick version. That’s what we ALWAYS make. Sorry I don’t have a picture of the finished product…every year we drink it all up before I remember to snap a shot! You ask, I deliver. Here is the recipe for the sweet potato souffle that my friend will be making this week for our feast. A nice alternative to the usual marshmallow concoction. My friend got the recipe from her sister who got it from a friend who got it from…well, you get the picture. Note from reader Matty: Use softened butter and mix with the flour and brown sugar (like a crumble). Once that is sprinkled over the sweet potatoes, cover with chopped pecans. I finally have a Thanksgiving menu plan put together (with the help of my friends who we’ll be eating with). Can’t wait to see what you will all be eating this Thursday as well! This is a picture of our turkey from last year. We cooked the turkey in an oiled paper bag and it came out nicely. Click here to read more about this technique. Here’s our menu for this year. We’re going to be eating with two families on Thursday and are dividing the cooking tasks, so I don’t have to do it all this year. Yea! Please share your Thanksgiving menu! Today I’m venturing into the world of Indian cooking for the first time. 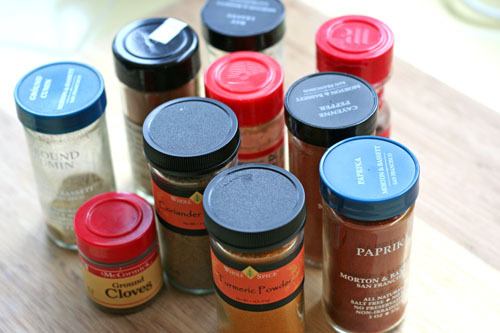 I started gathering all the spices I will need for the two dishes I’m preparing. This isn’t even all of them! I have a feeling it will be a very flavorful and fragrant dinner. I know, menu planning this week is kind of funny, but if you have a plan, please share it! And if you have a Thanksgiving meal plan, please click over to this post and share. Thanks! If all fruits and vegetables were this cute, my kids would gobble them up! For the record, Cate looks grumpy because I forced her to pose with the apple. The apple actually made her very happy. Apparently, the camera has the opposite effect. Little stinker. We picked up a few Lady apples at a local market this week. Anna was very excited about the “baby apples! baby apples!” Turns out they have an interesting history. 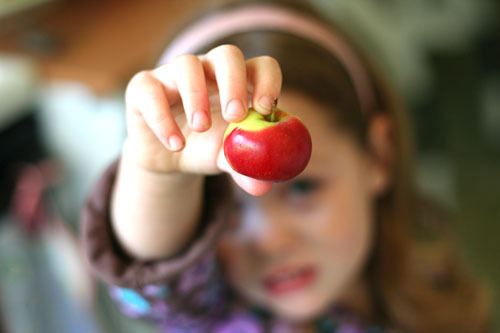 The Lady apple is an heirloom variety that is also the oldest known apple variety. How about that? Click here if you want to learn more! Thanksgiving is only 1 week away! I think it’s time we start our preparations, don’t you? 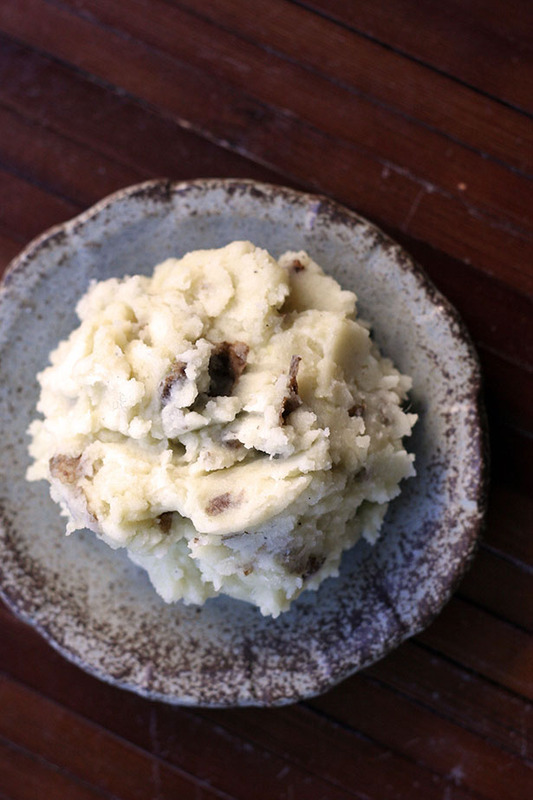 Today I’m going to share all my mashed potato tips so we can all win at mashed potatoes. What’s a Thanksgiving feast without mashed potatoes? I thought I would share my various mashed potato tips and variations with you. Some of these mashed potatoes can do the twist, while others are classic and comforting. Whatever your taste (or dance style! ), one of these options should tickle your potato fancy! 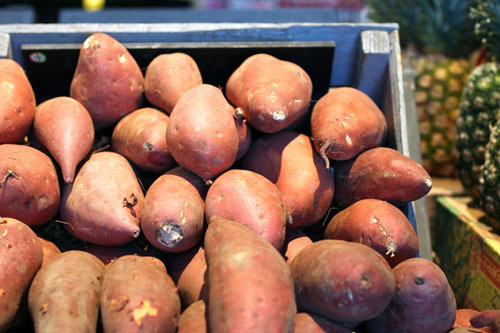 I like to use Russet potatoes, although Yukons work nicely, too. To cook, cut potatoes into similar sized chunks, about 2 inch-square. Place in cold water, boil over medium/medium-high heat until soft enough to mash, then drain the water. When you add the cream or milk and butter, be sure to warm them first before adding to the potatoes. It truly does help with the texture. Lastly, don’t be shy with the salt! That said, add a little at a time so you don’t oversalt your potatoes…but adding enough salt is key to successful mashed potatoes. For my classic fluffy mashed potatoes I use cream (milk can work if that’s all you have), butter, salt & pepper. Peel the potatoes before cutting up. Cook as described above. Warm the cream and butter prior to adding to the potatoes. Add cream a bit at a time to achieve the right consistency, as well as butter (4 Tbsp per 2 large potatoes), and salt & pepper to taste. Blend well with hand mixer. Same recipe as the Classic, but don’t peel the potatoes and add some garlic cloves when you start mashing. For 2 large potatoes I added 2 garlic cloves, using my garlic press. This is an idea from Rachel Ray and it’s very tasty. Chop up bacon, cook on the stove, then sauté in chopped leeks with the bacon. When mashing the potatoes, add the bacon, leeks & chopped tomato as well as milk or cream, salt & pepper. Hand mash with a potato masher instead of with a hand mixer. Cate and I sampled butternut squash mashed potatoes at Williams-Sonoma last week and Cate loved them! They also are a nice complement to a traditional Thanksgiving meal. Simply make classic mashed potatoes and add a bit of the Williams-Sonoma butternut squash puree. If you want to make your own puree, the ingredients are squash, brown sugar, broth, cinnamon and nutmeg…I have no idea the amounts since I just read the ingredients off the jar! I know these recipes aren’t very exact. I never measure when I make mashed potatoes, but if you have any questions please let me know! Also, if you have your own mashed potato tips or another recipe to share, please do! Recently Nate’s lab at Stanford went on a team building trip with Parties That Cook. They went on a special tour of the Ferry Building, including a behind the scenes look at Acme Bread. The day ended with a cooking class and then they got to eat all the amazing food they cooked. I was SO jealous all day, knowing what Nate was up to without me! He did bring home some yummy goodies to try to make me feel better. It kind of worked. He also came home with a great kitchen tip! The chef who taught the cooking class said that he breaks up his garlic bulbs as soon as he buys them. 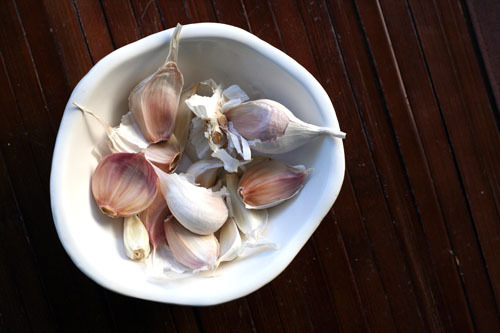 It helps the garlic keep fresh longer by airing it out and reducing the chance of moisture getting between the cloves. Basically, it will take longer for the cloves to turn green (green cloves = bitter garlic). I’m really excited about this tip…I HATE cracking open garlic cloves only to find they’ve turned green. Hopefully that will happen less often now!